454 shotgun sequencing was used to identify thousands of in silico microsatellite loci from two Australian freshwater turtle species (Pleurodira, Chelidae), Elseya albagula and Emydura macquarii krefftii. Twenty-nine polymorphic microsatellites were subsequently developed and tested as markers, 15 for E. m. krefftii and 14 for E. albagula. The former marker set showed greater allelic richness (mean N A = 7.7, range 3–15) than the latter (mean N A = 4.4, range 2–8). Levels of expected heterozygosity were high for both marker suites (mean H E = 0.718, range 0.177–0.875; and mean H E = 0.567, range 0.317–0.827, respectively), indicating both are suitable for studies of population genetic structure, connectivity and mating systems in these taxa. 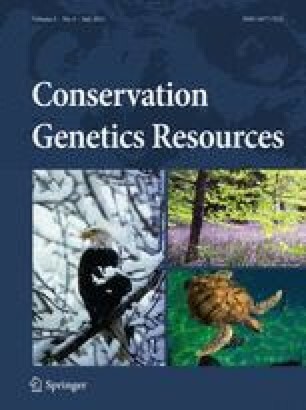 Cross-species amplification in 12 other short-necked freshwater turtle taxa highlighted the potential utility of these markers in other species, notably Emydura spp., Rheodytes leukops and Elusor macrurus. We thank Queensland Turtle Research and Jason Schaffer for providing tissue samples and fieldwork opportunities. Arthur Georges kindly provided many tissue samples for cross-species testing. Kyall Zenger provided helpful sequencing advice and assistance. Ivan Lawler, Dave Jones and Carolyn Smith-Keune also provided invaluable advice and support. This work was partially funded by research grants from the Wildlife Preservation Society of Queensland, Wildlife Preservation Society of Australia, and the Peter Rankin Trust Fund for Herpetology. Research was conducted under ethics permit no. A1444.